Dagon was referred to as the Chief Deity of the Philistines that dates back to the Third Millennium BC. He was heavily worshipped in the cities of Azotus, Gaza and Ashkelon. Little is known about Dagon regarding the Canaanite pantheon and Dagon’s role, but the position that he used to play in Palestinian religion is quite evident. He was the god of fertility and crops. He was typically portrayed with the upper body of a man, and the lower body of a fish. “Dag” is actually the Hebrew translation for “fish,” and “dagan” means grain in Greek. Often times, Dagon was associated with a female deity named Derceto. She also had the upper body of a human with the lower body of a fish. This may explain why Dagon is regularly portrayed as a half-fish, half-man creature. Coins from ancient Phoenician and Philistine cities indicate that Dagon was not solely represented as a fish-like creature. The fish lower body may be due to different perceptions of Dagon that could have developed around the Mediterranean Sea. Dagon was one of four sons to Anu, the Sumerian sky god. 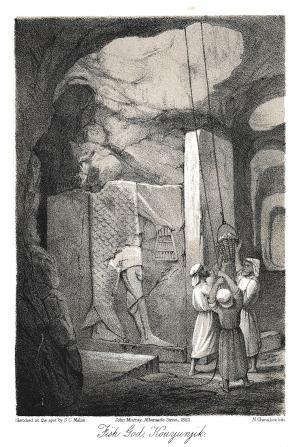 Dagon’s son Baal, later took on the role as the god of fertility. His brother El was the “father of humanity,” and was typically portrayed with bullhorns. The depiction of deities with bullhorns is actually evident in many ancient civilizations. Although Dagon was the Chief Deity in Palestine, he was considered second to El in the Canaanite pantheon. King Zimri-Lim of Mari made an interesting reference to Dagon in 18th century BC, written by Itur-Asduu an official in the court of Mari and governor of Nahur (the Biblical city of Nahor) (ANET, p. 623). It refers to a dream of a “man from Shaka,” then Dagon appeared. He blamed Zimri-Lim on the failure do defeat the King of the Yaminites because he did not report his actions to Dagon. He promises Zimri-Lim, “I will have the kings of the Yaminites cooked on a fisherman’s spit, and I will lay them before you,” (ANET, p. 623). The religious practices involving Dagon continued to at least the second century BCE. At the time, the Israelites established a monarchy, and Palestine became their biggest enemy. Dagon’s reign as a deity more than likely ended after to the destruction of temple at Azotus.